THE Derwent Valley Council office and depot will be closed from noon this Wednesday, December 24, until 8.30am on January 5, 2015. Garbage and Recycling Collection will operate as normal. The National Park Waste Transfer Station will operate as normal. The Peppermint Hill landfill site will close at 11.30am on December 24 and will be closed on Christmas Day. The site will reopen on Boxing Day. New Norfolk and Bushy Park swimming pools will be closed on Christmas Day. The Valley Children’s Centre will be closed from December 24 and will reopen on January 5. The council’s emergency telephone number is 6261 8500 (24 hours). For police, fire and ambulance emergencies call 000. For non-emergency police matters call 131 444. BELOW is my latest councillor update, published in the Derwent Valley Gazette on December 10, 2014. Bronte House mid-restoration this year. TONIGHT'S council meeting gave in-principle support to a proposal to lease to the Derwent Valley Community House part of the building known as Bronte House at Willow Court. It was not an easy decision. One councillor voted against the move and I can understand why. But the decision was not a knee-jerk reaction as one person remarked when leaving the meeting. Neither is it a fait accompli. The parties involved still need to negotiate a lease agreement and that document will have to come back to the council for approval in the new year. It needs to be said that the Community House is not being forced to relocate from its current premises just along the Avenue and still within Willow Court. Neither will the move result in the "loss" of Bronte House as some have stated. The Community House has been looking for new premises for several years and despite being offered accommodation at Carinya Education Park (my preferred option) the board of the Community House has consistently expressed its desire to remain in the general area of Willow Court and in particular reasonably close to its community garden. The council has been involved in discussions with the Department of Health and Human Services (the principal funder of community houses) for some months and in September the department made a formal offer of funds for infrastructure and capital works associated with moving the Community House into Bronte House, subject to the council offering a long-term lease. A special meeting of council was held in early October to discuss the various options for the use of part of Bronte House and I raised a number of concerns including the apparent abandonment of the original concept of Bronte House being the visitor services hub at Willow Court. That meeting was attended by a number of members of the Community House board of management and after considerable discussion with them, the council resolved to seek architectural drawings and costings for two designs; one providing for spaces that could be shared by the Community House and the Willow Court visitor services (toilets, kitchen etc) and the other having no shared spaces. The proposal was considered by the Willow Court Conservation Special Committee at its meeting in November. The committee noted the positive aspects, including the significant investment of additional funds to complete the refurbishment of the building as originally planned. But it also noted the need for some public space, including display space within Bronte, in order to provide basic services and information to general visitors to the precinct. In the end the committee formed the view that those requirements should be able to be accommodated in conjunction with the use of Bronte House by the Community House. Work inside Bronte remains incomplete. And so the proposal came back to the council meeting held tonight. Several members of the public expressed their opposition to the plan and I understand their reasons. Unfortunately the funds available for Willow Court are all but exhausted. Much work remains to be done and there is no further funding on the horizon. 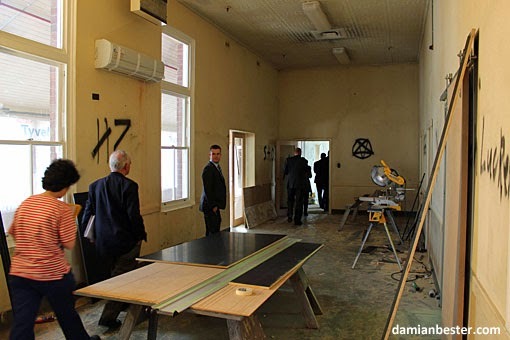 While considerable work has been done in Bronte House to prepare it for the provision of visitor services, large parts remain unusable and proposals for a commercial kitchen have been shelved due to lack of funds. 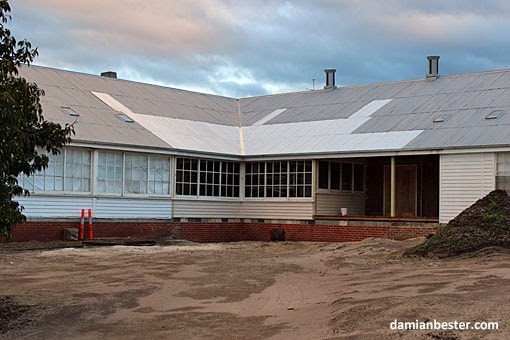 That council give in-principle support to the use of part of the Bronte Building for a community house pending successful negotiation of a lease agreement to be approved at a future council meeting. That the necessary structural alterations be at no cost to the council. That the area of the lease be based on the plan labelled Option 3, without the visitor kitchen installation and subtracting the area described as "reception". That a front entrance ramp be provided along the front of the building for entry to the community house and that a retractable concertina-style wall be installed across the dining room. That two accessible toilets be installed in the council visitor services area rather than a single accessible toilet and two standard toilets. This motion was seconded by Cr Barry Lathey and when put to the vote it was endorsed by all councillors but one. Before the council decision becomes a reality, a suitable lease will need to be negotiated and then approved by another council meeting. Everyone with an interest in this matter - for or against - will have another opportunity to be heard at that time. Co-locating the Community House in Bronte House is going to mean some changes to the arrangements for visitor services at Willow Court, but those arrangements had changed already through the decisions of the Conservation Committee. Despite my misgivings about the proposal, moving the Community House into Bronte does not mean it is a building lost. It is a building saved. Council Workshops will be held at the Courthouse, Circle St, New Norfolk, at 6.30pm on Thursday, 4 December 4, 2014 and Thursday, December 11, 2014. The new format for council workshops is an open session which the general public is invited to attend for the first half-hour. The remainder of the workshop is closed to the public. This is an informal workshop of council and no agenda is provided. Responses to submissions received on the Annual Report. Matters relating to the Annual Report will be open for discussion at the meeting and members of the public are invited to attend. Written submissions on any matter contained within the Annual Report are invited and should be received by Friday, December 12, 2014. Copies of the Annual Report are available from the Council Office, Circle St, New Norfolk from Thursday, December 4. An ordinary meeting of council will be held at the Courthouse, Circle St, New Norfolk, at 6.30pm on Monday, December 15. The public is invited to attend and the agenda will be available at the Council Office, Circle S, New Norfolk, from Tuesday, December 9. THE agenda for the first meeting of the newly-elected council included a few Motions on Notice from me. There was a good discussion around most of them and I thank my council colleagues both for their comments and their unanimous support. That a list of all land and buildings owned by the council be provided to all councillors. That the council's land sale committee be requested to review potential asset sales to fund ongoing works at the Willow Court historic site. The background to those first two motions is that the available funds for Willow Court are practically exhausted and no further State Government support is on offer. The previous council informally discussed the sale of surplus land as a way to fund urgent works at the historic site. This has been expanded to include a review of all council-owned land and buildings. When the Land Sale Committee meets, it should be open to the public. That the General Manager investigate and report on loss of grant funding for a footpath at Westerway. Background: In 2013 the council secured grant funding of approximately $100,000 to build a footpath at Westerway. More than a year later there is still no footpath and councillors were recently advised that the funding had been withdrawn by the State Government. The general manager's report should determine how the money was lost and what procedures have been developed to ensure no further grant funds are lost. That the General Manager investigate and report on the Glebe Road reconstruction carried out last year. Background: Major works were carried out on Glebe Rd between Lachlan Rd and Poulters Rd last year. For reasons not explained to councillors, the centre line was repainted way off centre, forcing west-bound traffic onto the extreme edge of the road. This has resulted in extensive edge breaking, which is ongoing. The general manager's report should determine why this happened and who is responsible for rectification works. That the council continue its recent practice of holding councillor workshops on the first, second and fourth Thursdays of each month. That these workshops be advertised and open to the public for the first 30 minutes. That a councillor social function be held when a month has a fifth Thursday. By way of background to the above three motions, in recent months the council has held councillor workshops on a weekly basis and this resulted in an improved flow of information. Continuing the practice will benefit the incoming council. Organising a regular social function was a stated aim of the last two councils but no action was taken to bring it about. During discussion I was asked about the cost burden of advertising and my comment was that no additional advertisements should be necessary as each month's meetings and workshops should be able to listed in a single advertisement. That the Council Planner be invited to conduct a briefing for the new council, covering the Development Application process and the new planning scheme. 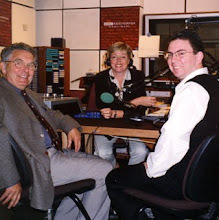 councillors. A briefing from the planner would be most worthwhile. IT'S been said that laws are like sausages - it's better not to see them being made - and the same could apply to the biennial appointment of councillors to committees. This lengthy process was carried out at the new-look Derwent Valley Council's first meeting last night and it's fair to say some in the full public gallery grew restless as the lengthy list of committees, statutory bodies and associations was worked through. *Subject to confirmation of the minutes next month. ** No offence intended to the purveyors of fine locally-made sausages..
My "thank you" ad in this week's Gazette. Click to enlarge. 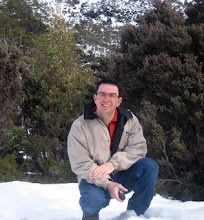 My sincere thanks to all those who supported my re-election to the Derwent Valley Council for a second term. 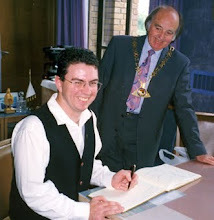 I will keep sharing council news via this blog and by advertising in the Derwent Valley Gazette and urge you to get in touch with me whenever there is something you want to know about council business. The overall election result shows a clear desire for change. All sitting councillors had a reduced vote and five of my colleagues will not be returning to the council table. I wish them well and I offer my congratulations to the four candidates elected to replace them. Following the recent decision of the Local Government Board we are now an eight-member council rather than nine. Please let me know what priorities you would like to see pursued by the new council, using the comment function below or by sending me an email or giving me a call. I will raise your concerns at a council meeting. I also encourage you to attend council meetings and community forums. Ask questions. Lobby your councillors and respond to requests for public comment. I hope that candidates who were not elected will maintain their interest in council activities and play a role in keeping all councillors to their promises. My first term on council flew by and the next election will be here before we know it. THE time has now passed for popping your council ballot papers into the post, but there is still a chance to have your say by dropping your papers into the ballot box at the Derwent Valley Council Chambers in Circle St, New Norfolk by 10am today (Tuesday). At the time of writing, just over 52% of eligible voters have returned their voting slips by post. This puts the Derwent Valley in 17th place out of the 29 councils and just ahead of the state average of 49.85% participation in the election. IT'S a simple message this week: please vote. As of today's mail, 3331 votes in our council election have been received by the Tasmanian Electoral Commission. This is a participation rate of 46.61% which means about half of those eligible to vote in our election have not yet done so - and I'm one of them. As I understand it, the return rate does not include those votes which have been lodged at the Derwent Valley Council Chambers, so the tally is probably somewhat higher than suggested. We are slightly ahead of the state average, which is running at 44.29%. In the Derwent Valley we all have a lot to say about our council. Council elections provide the best opportunity for you to express your opinion and as the polling period draws to a close I urge you to have your say in the most powerful way. Please vote. Voting in council elections is not compulsory but it is easy. Your ballot pack contains your voting slips, a booklet with information about each candidate and an envelope to return your vote. If you have misplaced your booklet, you can read the candidate statements here. If you have not received your ballot pack, please contact the Tasmanian Electoral Commission on 1800 801 701 or call at the council chambers in New Norfolk on Monday. Voting closes at 10am on Tuesday, October 28. If you miss the post on Monday, there is a ballot box at the Derwent Valley Council Chambers. I'll be posting my vote this weekend and I hope about 3000 fellow residents of the Derwent Valley municipality will be doing so as well. A REMINDER that the final monthly meeting of the Derwent Valley Council in its current form will be held on Wednesday, October 22 at 6.30pm. The public is invited to attend the meeting. Please join us - and if you would like any assistance or information about the meeting, please do get in touch.The meeting agenda is available online. This advertisement appears in this week's issue of the Derwent Valley Gazette. 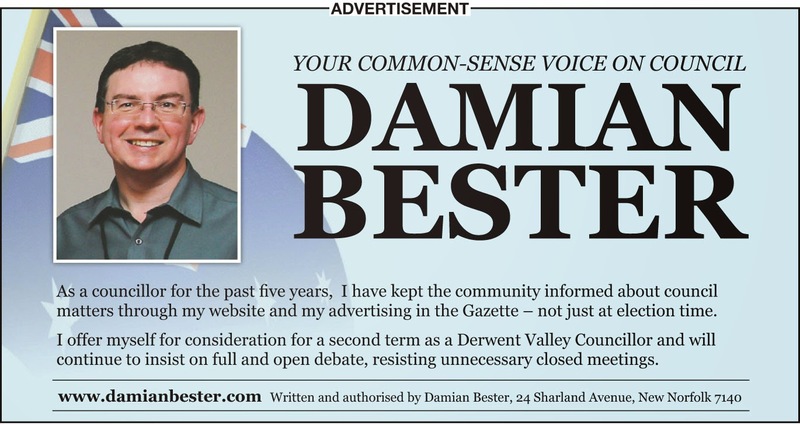 MY second campaign advertisement appears in this week's Derwent Valley Gazette and deals with two issues very close to my heart. These are my independence and my belief that a properly restored and developed Willow Court historic site will rival Port Arthur and bring visitors in droves. I also had a little bit to say about council expediture too. There has been considerable discussion about the increasing role of party politics in local government, in particular since the State Government changed the law around eligibility for election as mayor a few months ago. I don't believe there is any place for party politics in councils. If you want an independent councillor you should ask how "independent" your preferred candidates are. I have no party and no backers. I authorise my own campaign statements and have accepted no donations. I have not asked for or accepted any offers to display signs or posters and took some convincing to allow a very determined friend to letterbox some of my surplus leaflets to areas outside the main distribution area. You can read more about candidate disclosure here. Council expenditure remains a real concern to me. I am sure we can do better, but it requires a majority of councillors to be of a like mind in this regard. We have tinkered around the edges and saved a few dollars by ceasing the catering at councillor workshops but we have not been able to direct sufficient funding to the reconstruction of our roads in particular. I'm not sure we can achieve the improvements we would all like to see if we eliminate increases in the rates and reduce some of the charges as proposed by some candidates. Hypothetically speaking, if you have a 0% rate increase when inflation is running at 2.5% per cent, the budget is immediately at a disadvantage. That said, rate rises aren't the only way to increase the council's revenue, so I'll be keen to hear what any new councillors have to say on this. Which brings me to Willow Court. The council's complete mishandling of this historic site was my main reason for seeking election in 2009. I won't go over old ground here, but the new council didn't exactly get off to a great start on this either. Then, in 2011-12 I put a new plan for Willow Court to the council and the outcome is that the first stage of the redevelopment is nearly complete. One wing of the Barracks and most of Bronte House has been restored and will soon be opened to visitors. This is largely due to the efforts of the Willow Court Conservation Committee appointed by council in 2012. 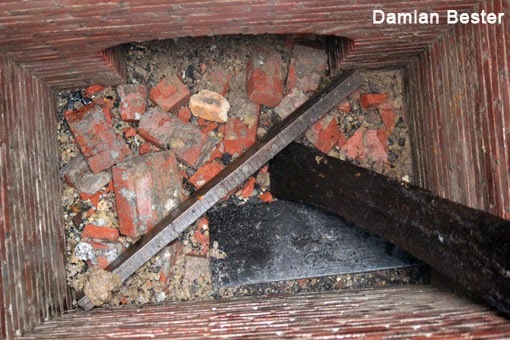 Next month will see some preliminary work done in advance of an archaeological investigation that will start in Willow Court early next year and has the potential to go on for several years. This will include the colonial tunnel or sewer that connected Willow Court to the River Derwent via Burnett St and I'm really excited about this. I think the word "passion" is over-used these days, but there's no doubting that Willow Court is something I am passionate about and the job is far from finished. The final monthly meeting of the Derwent Valley Council in its current form will be held on Wednesday, October 22 at 6.30pm. The public is invited to attend the meeting. Please join us - and if you would like any assistance or information about the meeting, please do get in touch. The meeting agenda will be available online from the afternoon of Thursday, October 16. THANKS to everyone for their kind remarks about my first campaign advertisement in the Derwent Valley Gazette this week. As with my first campaign in 2009, I won't be littering the landscape with election signs. I really appreciate the support of those who have offered to place a sign in their yard, but I will be sticking with press advertising, a leaflet and this blog. Communication was one of the two big issues behind my decision to stand for council five years ago. The flow of information between council and the community could still be better, but a great improvement has made during the last few years. It is easier to obtain the documents for each council meeting than it was before; the public is asked for its input into council decisions more often than before; and a council newsletter is issued three or four times a year. More can be done to improve council communications and you would be surprised to know how often councillors are left out of the loop too. Most councillors were given no information about the stage of the Tour of Tasmania being held between Strathgordon and New Norfolk earlier this week, despite our council being a major sponsor. Communication will remain one of my key issues. 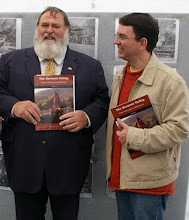 I commit myself to continue the upkeep of this blog and my advertising in the Gazette, and I will seek to improve the distribution of the council newsletter. Communication is a two-way street, so let's hear from you too. Council elections are conducted by postal ballot. Election material (including the ballot paper) is mailed directly to each elector. This process is due to start on October 14 and every elector should have their ballot packs by October 17. Voting is not compulsory but to have your vote counted it needs to be returned to the Tasmanian Electoral Commission by 10am on October 28. Please note: Following the issuing of the notice of election, readers' comments relating to the election must include the given name, surname and locality of the writer. Anonymous comments cannot be published. How have you supported cycling in the past? I support cycling for sport, recreation and transport. 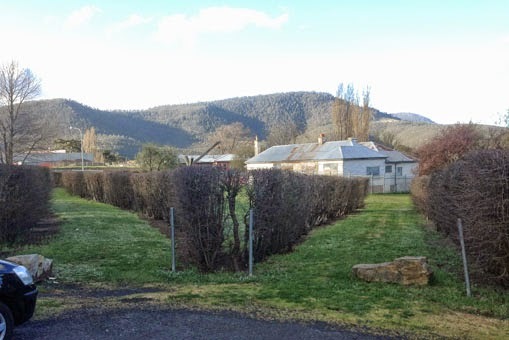 The Derwent Valley Council in partnership with the State Government has recently improved bicycle facilities at New Norfolk's main car park/bus station, and the council has sponsored the Tour of Tasmania for several years. Funding has also been secured for the upgrading of New Norfolk's main walking and cycling track. Do you support the infrastructure projects proposed by BT in your Council area? While I have not had a recent update on the proposed Derwent Valley Rail Trail, I support the general concept particularly for the benefits it could bring to the Upper Derwent Valley. Do you support increased car parking in your local CBD? Parking requirements have not been specifically surveyed as far as I'm aware, but recent development projects in New Norfolk mean there is probably no immediate need for increased car parking in the town's CBD. To lobby for legislation requiring timely disclosure of all political donations and gifts at all levels of government. To facilitate voluntary disclosure of political donations and gifts. 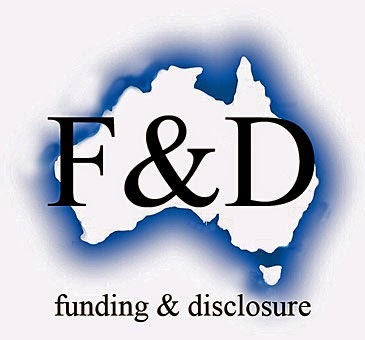 To provide forums for discussion of matters relating to political funding, funding disclosure and related topics. The group has a website and Facebook page and it gained some mainstream media attention when announcing its intentions earlier this month. It invites all candidates in the 2014 Tasmanian local government elections to register, declare any donations or gifts received in the last 12 or 24 months, and then make progressive diclosures of all donations and gifts received during the election period. I am a self-funded candidate and have not received any donations over the $100 threshold proposed by Funding and Disclosure Inc. I don't believe I have received any donations under the $100 amount either, although I was once given a bottle of wine (not Grange and sadly not Derwent Valley). Funding and Disclosure Inc also asked about political party affiliation. I have none, and never have. My impression is that those councillors who have hitched their wagon to one party or another have generally ended up pretty much disappointed by the experience. I prefer to tread my own path. In this election I'm once again offering myself to serve the residents and ratepayers of our municipality, equally and without fear or favour. FOLLOWING yesterday's report in the Derwent Valley Gazette about Illabrook Dam, I was contacted by the owner of the land surrounding the reservoir. He was keen to discuss the comments made by councillors at last week's council meeting, which were accurately reported in the Gazette. The dam was built by the council many years ago and provided New Norfolk's water supply for several decades. It was taken over by the State Government prior to my election to council and is now owned by TasWater. Over the last few months there has been growing concern for the future of this asset and speculation that it was to be decommissioned or removed. Last week's council meeting debated and approved a proposal to form a working party to investigate ways to keep the dam intact as a recreational facility if it is no longer required as a domestic water supply. It has been difficult to get a clear picture of the issues at Illabrook, so I was particularly pleased to hear from the landowner and invited him to meet with councillors. A great discussion was held tonight and there was an agreement to keep talking about the future for the dam. 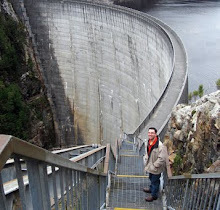 It should be understood that the dam is surrounded by private property and neither I nor the council encourage anyone to trespass on that private property to access the dam. THERE was great news for local students today with the announcement of a $300,000 Federal Government grant for a project known as "Tree2Sea". The money comes from Medicare Local via the Tasmanian Health Assistance Package. A boat-building project developed in partnership by the Derwent Valley Community House, Derwent Valley Council, New Norfolk High School and Workskills Employment, it will involve students in the construction of kayaks and sailing boats under the supervision of a skilled craftsman. Through the project, students will learn more about health and nutrition, boat and water skills and safety, boat building and project development, website development and multi-media skills, literacy and numeracy, kayaking and sailing. Participants will learn about the environment and sustainable practices in protecting waterways and forestry and the project will also help them to identify possible future employment pathways. Congratulations to everyone involved in bringing this project to our municipality, including the councillors and council staff who have been assisting over the last year or so. The funding will be provided until June 2016. THE Local Government Amendment (Mayoral Candidate Eligibility) Bill 2014 has passed the Legislative Council and now awaits the Royal Assent. The effect of the Bill is that mayoral and deputy mayoral candidates will no longer be required to have previously served on a Tasmanian Council for 12 months. The Notice of Election for all 29 Tasmanian municipal areas will be published on Saturday 13 September 2014, after which time nominations for all 263 councillor/alderman positions, 29 mayors and 29 deputy mayors will open. Nominations will close at 12 noon on Monday 29 September 2014 and will be announced at noon the following day, Tuesday 30 September. A Candidate Information Booklet and the nomination form are now available on the TEC’s website, or in hard copy by calling the TEC on 1800 801 701. 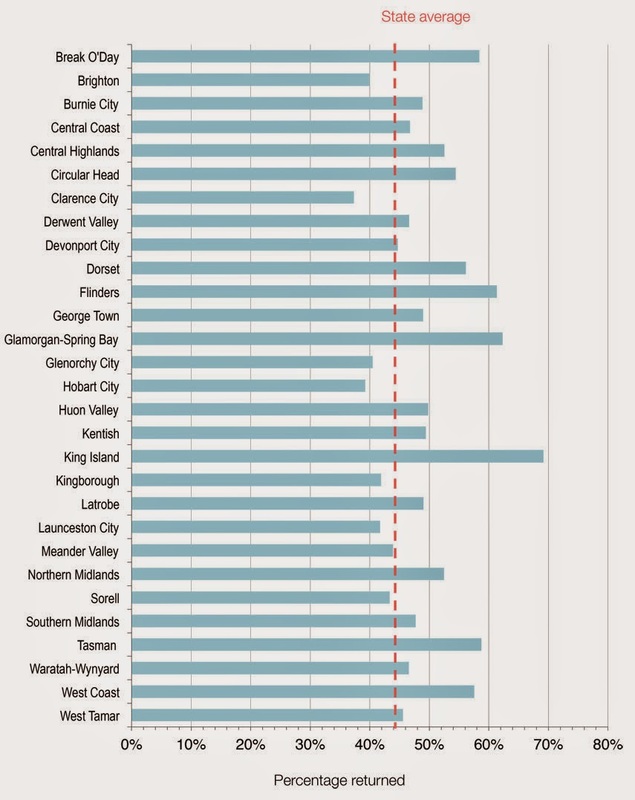 This year’s elections will be Tasmania’s first “all-in, all-out” local government elections. Voters will next get a say on who represents them in local government in Spring 2018.